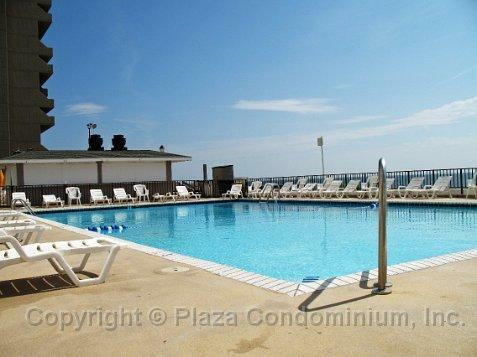 Ocean City MD Vacation Rental – Plaza 0502 | North Ocean City (94th St to DE Line) Ocean City MD Rentals. PLAZA 502 9800 Coastal Hwy Saturday to Saturday NON SMOKING - NO PETS Lovely! Direct Oceanfront, updated 2 bedroom (Den enclosed to make 3rd bedroom with pocket door, TV and a queen sleep sofa), 2 bath unit. Balcony access from Living Room and Master Bedroom. This condo features new furniture in the living room (2019), new balcony furniture (2019) and new king bed in MB, a well-equipped kitchen, dishwasher, microwave, and 4 Flat Screen TVs, 4 DVD players. Washer and Dryer in unit. Maximum Occupancy is 8. BDRM 1: King BDRM 2: 2 Doubles DEN/BDRM 3: Queen Sleep Sofa (Den is 3rd sleeping area) Registration fee $50, payable from May 1st through October 31st, includes parking for two vehicles. Fee for extra vehicles: $50.00 per vehicle/per week (cash only). The Plaza has on-site Restaurant and Tiki Bar (In Season), 24-hour Security, dry - heat Saunas, Hot Tub, indoor, outdoor and kiddie pools. OWNER-PAID WI-FI AND FREE BEACH LOCKER! My family had a wonderful time staying in this condo. It is child-friendly and very comfortable. The Plaza is just an awesome place to vacation! Great vacation spot. Loved the balcony and the view was perfect. Nice amenities, clean and plenty of room for the family. Loved it. The place was great. Had all the amenities that were needed to have a relaxing getaway. Staff was very friendly and helpful. Would recommend this to friends and family.